Home home interiors gifts Bodum Assam 2-Cup Tea Press – Tea For Two! I once sourced the Bodum Assam 2-Cup Tea Press for an uber cool coffee shop – yes don’t worry they were serving tea as well! This teapot went down very well with the customers. They are great for use with loose leaf tea whether you like a traditional black tea or you prefer a scented, green or white tea. This teapot looks cool and it holds two cups so it is great when you have someone over for a cuppa! Although it is made from glass it is dishwasher safe so it has a practical edge as well! I have to admit that I like Bodum a lot – they provide reasonably prices house accessories and gift items. I once spent quite a while in their multilevel store in Copenhagen – oh the memories and the shopping! But that is a whole other story……. 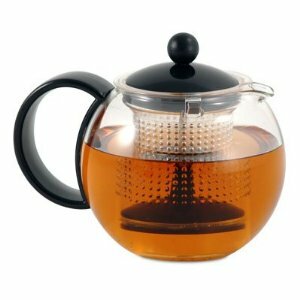 The Bodum Assam 2-Cup Tea Press is available here at $23.50.